This course will provide you with an overview of how land and property are registered and how ownership occurs. This course will provide you with an overview of a real estate transaction; in particular, listing and selling. This course is offered in combination with the Residential Real Estate Transaction. You may enrol in an 80-hour classroom session where both courses/textbooks are presented. Or, you may enrol in an e-learning or correspondence session for the Real Estate Transaction–General and then enrol in a 40-hour classroom session for the Residential Real Estate Transaction. You will write one exam upon the completion of both courses. This course will provide you with a detailed overview of a residential real estate transaction, from the listing agreement to the final sale. It will also explore current trends and issues that affect residential real estate. As an alternative to taking this course independently through a 40-hour classroom session, you may enrol in a combined 80-hour classroom session of The Real Estate Transaction—General and The Residential Real Estate Transaction. This course will cover the legal issues concerning property ownership and provide you with an overview of several pieces of legislation. This course will provide you with a detailed overview of a commercial real estate transaction, from the listing agreement to the final sale. It will also explore current trends and issues that impact commercial real estate. Real estate is a regulated profession. How to Obtain Salesperson Registration with RECO. Complete the Pre-registration segment (first 5 courses) of the program. The elective course may be taken either before, or after, registration as a salesperson with RECO, as long as the Pre-registration segment has been successfully completed. This course will provide you with a basic understanding of valuation theory. It will develop your ability to evaluate property as you engage in the buying and selling of real estate. This course will explore the increasingly sophisticated demands of commercial real estate clients and investors, who require complex calculations and valuations. If you decide to focus on commercial real estate, this course will teach you the analytical methodology of comparing cash flows and returns to determine the present value of future benefits. This course will expose you to the mortgage market and provide you with hands-on activities relating to forms, applications, and mortgage calculations. This course will cover the day-to-day issues and responsibilities of property managers. 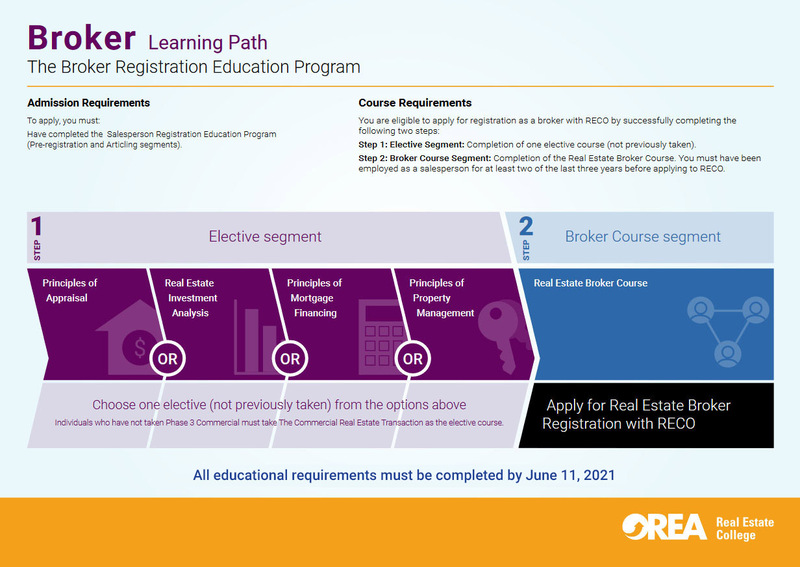 If you are a real estate salesperson, you can become a broker by successfully completing the Broker Registration Education Program, and then applying to RECO for registration. An additional elective must be completed before taking the broker course. This course will provide you with an overview of how to establish, operate, and manage a real estate brokerage. Create an account and submit your paperwork.